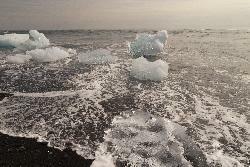 Photo of drifted Ice Bergs at a black sand beach near the Jökulsárlón (Jokulsarlon) glacier lagoon. from site: The Breiðamerkurjökull is a tongue of the Vatnajökull, It ends in a small laguna. Pieces of ice breaking off the glacier slowly drift towards the sea. Vatnajökull Glacier Links: Grímsvötn Volcano in Wikipedia. 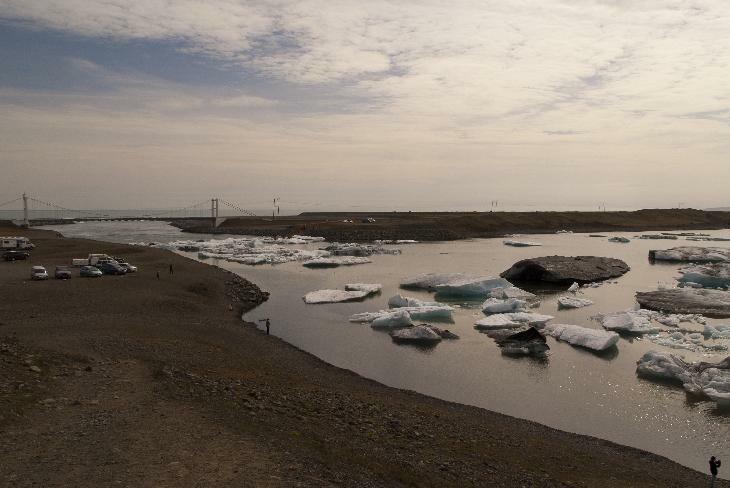 from site: The Grímsvötn sub-glacial lakes and the volcano of the same name are in South-East Iceland. They are in the highlands of Iceland at the northwestern side of the Vatnajökull ice-cap. from site: Vatnajökull (English: Glacier of lakes) is the largest glacier in Iceland. It is located in the south-east of the island, covering more than 8% of the country. from site: Vatnajökull [ˈvaʰtnaˌjœːkʏtl̥] (English: Glacier of lakes) is the largest glacier in Iceland. It is located in the south-east of the island, covering more than 8% of the country. fro site: Vatnajökull is by far the largest glacier in Europe. It is situated in south-east Iceland and covers 8% of the total area of the country.